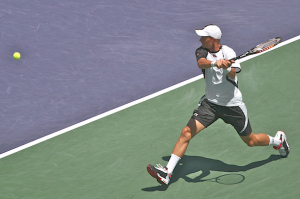 Tag Archive | "US Open"
Taking into account, the veil of lunacy and unpredictability that has shrouded the 2009 U.S. Open, one might have believed there was no further room for shock. Yet, today, in the finals, 20 year old Argentine Juan Martin Del Potro pulled off the element of surprise by vanquishing world number one and five time defending champion Roger Federer 3-6, 7-6, 4-6, 7-6, 6-2 in order to seize his first major. For the sixth year in a row facing a fresh rival at the tournament’s ultimate dance, Federer was regarded as the overwhelming favorite. 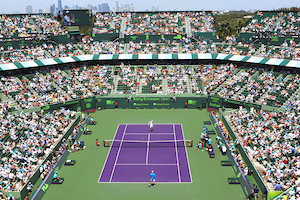 Subsequent to a love game, on his fifth break point, Federer used a forehand crosscourt winner to jump to a 2-0 lead. Then, Roger consolidated with a comfortable hold. 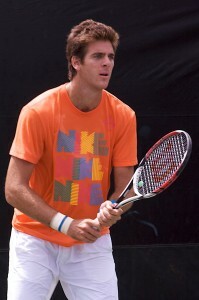 With Del Potro’s newbie status at the final of a major, he had difficulty encountering his footing the opening set. But, Juan Martin finally got on the board with ease for 1-3. While Federer never dealt with a break point, Del Potro’s treacherous adventure on serve continued. Serving at 2-5, Juan Martin’s forehand error gave Roger three set points. However, with his big serve, Del Potro salvaged the game. Nevertheless, Federer went on to close out the set. Del Potro started the second with four unforced errors, including two double faults, to hand Federer a break. By maintaining his near perfect play at net, Federer connected on a forehand volley for 2-0. After an untroubled hold by his opponent, Federer’s forehand miscues resulted in Del Potro’s initial break opportunities. With Juan Martin unable to capitalize, Roger stretched his lead to 3-1. Consequently, Roger appeared to be securing a choke hold on another title. Yet, despite multiple chances, Federer failed to capture a potential insurance break. After Del Potro kept the set alive with a love hold at 4-5, in front 30-0, Federer made a couple of errors for 30-30. The next point, Del Potro called on the tech review after a forehand up the line was presumed out. By a hair, Juan Martin was found to be correct. Now, an incredulous Federer stared at break point. Immediately, Juan Martin passed Roger at net with a forehand up the line to square the set at 5-5. 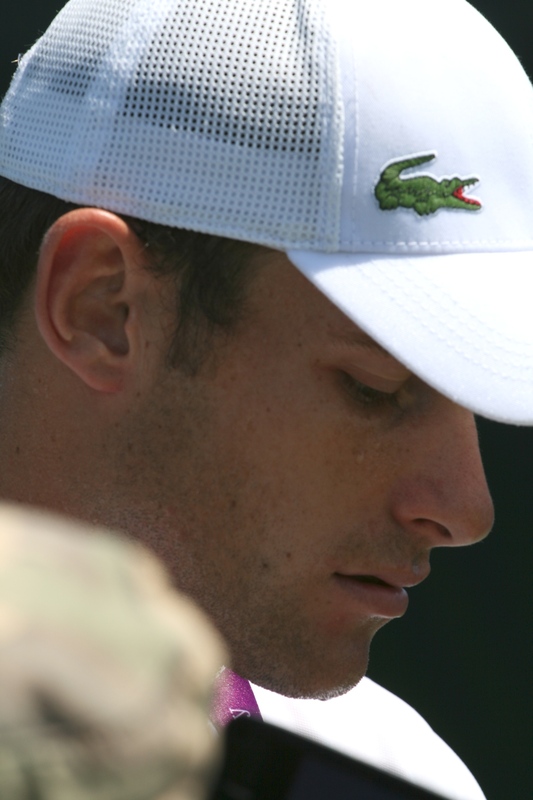 Roger’s failure at sealing the set preyed on his mind into a tiebreaker. A forehand error was all Del Potro required for a mini-break and to finish off the set. An abominable first serve percentage, a rival unwilling to capitulate, a perceived flawed challenge system contributed to Federer’s petulant mood the rest of the way. Roger even had an acerbic exchange with the chair umpire in the third set. To the contrary, Del Potro settled into a comfortable service rhythm. At 3 all and 30 all, Federer floated two straight forehands long to give Del Potro his first lead. But, the next game, Federer blotted out his mistake by making it 4 all. After dismissing another break point and holding, Federer ticked off that Del Potro took a little long to dispute a call utilized his displeasure to get to 0-30. As a result of Del Potro double faulting twice, Federer carried the set 6-4. This was not the script that one would have written two weeks ago. Fortunately for us, Kim Clijsters had her own pen for a rewrite. 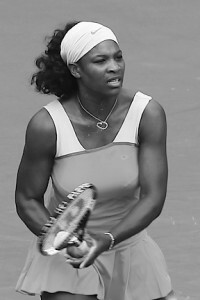 A couple of months after getting back on tour, Clijsters reached the U.S. Open final and defeated 19 year-old Caroline Wozniacki 7-5, 6-3 becoming the first wildcard entry to win a major. Although this was Wozniacki’s first final at a major, the Dane almost pulled off the role of spoiler. After Caroline dropped serve her first time out to give Kim a 2-0 lead, on her fifth break chance, she captured her first game. Then through her tenacity, Wozniacki compelled a crosscourt backhand error from Kim to break for a 3-2 edge. After teetering on the brink, Wozniacki double faulted to level the set at 4 all. However, the very next game, Caroline’s defensive skills helped her rally from 0-40 and break again for 5-4. But, serving for the set, Wozniacki faced another break point when Clijsters produced a forehand winner. The Dane was unable to exterminate that one as her forehand up the line sailed long and evened out the set. Unable to capitalize on two break chances, Wozniacki subsequently made four unforced errors to wrap up the set for Clijsters. After being miserly the first five games of the second set, with neither woman dealing with a break point, two forehand winners and a backhand mistake by Wozniacki provided Clijsters triple break point. When Caroline’s backhand landed long, Clijsters went ahead 4-2. Then, after staring at 0-30, Kim made a couple of good serves and winners which permitted her to consolidate for 5-2. Despite a tough hold, Wozniacki forced Clijsters to serve for the championship. A tad nervous perhaps, Kim made two forehand booboos to go down 0-30. Once Clijsters regrouped, with an ace and two forehand winners, she closed out the set to claim her second major and U.S. Open title.